The palace of the Archbishop of Modena-Nonantola is located at Corso Duomo, 34, immediately across from the front entrance of the cathedral. In the entrance corridor of the first floor is a painting recording the visit of Pope Pius VII to Modena in 1815. 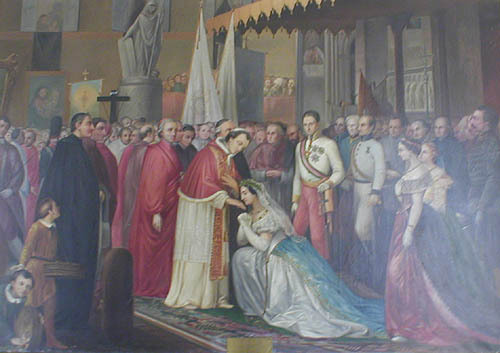 1 The painting shows Pius VII extending his hand to a kneeling Queen Mary III and II. Behind Mary stands her husband Duke Francis IV of Modena. Among the items owned by the Archbishop of Modena is a ring given to Monsignor Luigi Ferrari by King Francis I on the occasion of the baptism of his daughter Princess Anna Beatrice in 1848. 4 The ring is set with a hyacinth surrounded by twelve brilliants. There are also two ecclesiastical vestments which were given by Princess Maria Teresa, countess of Chambord, sister of King Francis: a purple velvet chasuble and a purple velvet cope. 5 It is possible that these are among the vestments now on display in the Museo del Duomo. 1 The painting is a 1901 copy by S. Grandi of an 1857 original by Geminiano Mundici. 2 Bartolomeo Pacca, Relazione del viaggio di Pio Papa VII a Genoa nella primavera dell'anno 1815 e del suo ritorno in Roma (Orvieto: Sperandio Pompei, 1833), 120-121. 3 Cf. a photograph in Albano Biondi, Il Palazzo Ducale di Modena: sette secoli di uno spazio cittadino (Modena: Panini, 1987), 263. The photograph was taken circa 1930. The painting was then located in the same room as Adeodata Malatesta's "Alfonso III d'Este taking the Franciscan habit". 4 Giuseppe Pistoni, Il Palazzo Arcivescovile di Modena (Modena: Aedes Muratoriana, 1976), 72. Image 1 (The Visit of Pius VII): © Noel S. McFerran 2007. This page is maintained by Noel S. McFerran (noel.mcferran@rogers.com) and was last updated ODecember 7, 2007. © Noel S. McFerran 2006-2007.